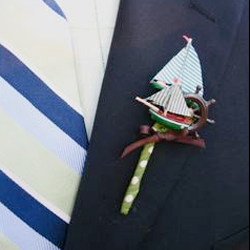 The man’s boutonniere in pinned on the left side (over the heart). Most experts tell you to angle the boutonniere, have the flower in the middle and at the broadest part of the lapel, pin (start in the back of the lapel) usually from bottom up into the stem. Use a second pin if not secure. What you don’t want is to have it flop or move during the event. As with all of life, practice, practice, practice. in the weeks before the event, practice on some willing friend. Keep the flowers fresh. Put them in the refrigerator—chilling them before use will make sure they are good looking and long lasting. An unusually look is the non-flower found at brides.com, shown in this photo, but the pinning will be the same (from http://rosenowfloral.com/frittsrosenow/).